Using Technology, People Who are Deaf Can Make Phone Calls Without an Intermediary! The Telecommunications Relay Service (TRS) provides free access to telecommunications to the deaf community by simply dialing 711. The TRS is operated by human intermediaries that transcribe text that can be read by a person with a hearing impairment via a text telephone (TTY). Pedius provides a similar service using no human intermediary and works on a standard computer, laptop, iPhone, iPad, iPod touch, Android phone, or tablet with no special equipment! When a user makes a phone call to someone with typical hearing through Pedius, their text message is read out loud through the phone to the other party. When the person responds using their voice, their response is transcribed into text so a user with a hearing impairment can read the message. If the user prefers, they can read incoming messages through text, and respond directly with their voice. 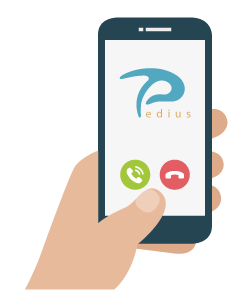 The Pedius app provides 20 free minutes of calling per month, and users can get unlimited calling for $30.00 per year. Alternatively, minutes can be purchased in increments of 100 for $5.00. To learn more, go to Pedius.org. To download the free app, go Apple’s App Store or Google Play and search for Pedius.